Exploring the need for waterproofing any deck leads to the conclusion that one plan may not serve the overall purpose. The deck, often consisting mainly of wood, or a composite, or even concrete is actually the sum of several materials. Performance Requirements of a Waterproof deck coating, therefore, require a more holistic look at the approach and the solution to extending the life, beauty and viability of any deck. This is why waterproofing is so interesting and so vitally important. It is also why so many regulations, local, state, federal and even international requirements play an important role. Common factors such as the amount of use, the type of traffic, weather, materials all factor into waterproofing requirements. Additionally, state, federal, and even international regulations help define the minimum standard for waterproofing products. Understandably, aggregating and collating all these factors into a focused approach to any job is by no means a simple task. From a certain perspective it resembles a complex equation that is often resolved elegantly. A recent law suit helps explain the complexity. This case, still in litigation, involves innovative waterproofing materials. The promise the maker made about the waterproofing product apparently did not live up to their claims. Still, passing no judgment, the problem the maker sought to overcome exposed the difficulties waterproofing faces and why there are requirements and standards. The promise was that the product is a high-performance coating for concrete and older wood surfaces. Sold with the express guarantee that it would seal cracks and fissures, aside from penetrating the surface to 1/4″ deep, the product apparently failed. Further, the waterproofing manufacturer claimed its product possessed qualities that resisted against cracking and peeling. Whether new or old, most surfaces experience the above problems. Waterproofing tries to solve them accordingly. In the above legal matter, the requirements for the surface in question were for high-volume foot traffic over an extended period of years. That is a similar situation, though not exhaustive, of the challenge that most waterproofing products seek to challenge — especially for household decks. That is why standards and regulations developed that should prove pivotal in the above trial’s outcome. Those standards and regulations for waterproofing products come from the ASTM. Standards and requirements promulgated through this regulatory body help to assure uniformity, safety and reliance of the waterproofing product. It also provides procedures for applying waterproofing systems with the same above goal. The overall focus is mostly to develop performance standards for the safety of the public and the performance standards of these products. Decks hold a special place in the world of waterproofing because they represent a microcosm of the problem worldwide. Why that is true requires just a brief look at a typical deck. They consist mostly of wood and metal (nails, joists etc.). The wood may require one waterproofing product while the metal requires another. Decks are often exposed to the elements and contraction and expansion issues always arise in these conditions. These forces are the major reason for cracking, splintering, and early ageing. Still, looking to the product itself reveals how it fulfills the requirements set forth by the controlling regulatory bodies. In the case of bonding there are two types. These polymers, based on various polymer chemistries, such as PVA, acrylic, VAE, SBR and more even require labeling as follows: ASTM C1059 Type I or II. The Type I bond coats are often identified by the ability to apply them by spray, brush or roller. They possess a re-dispersible or re-imulsifiable quality. 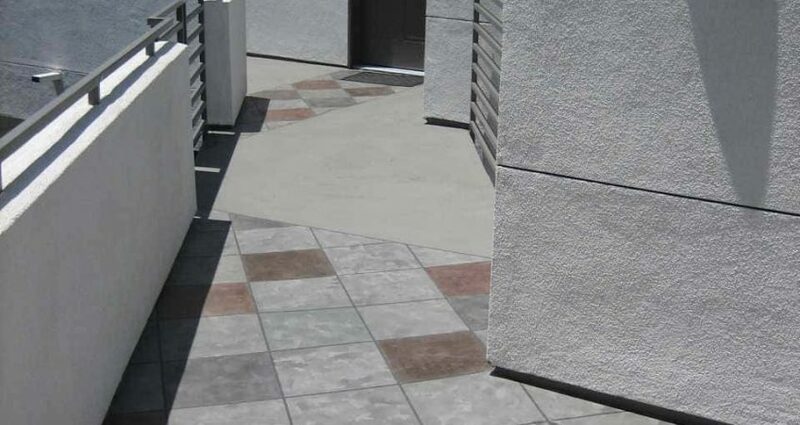 Placed or applied between two concrete layers, they create a waterproof system. The Type II are generally used in high humidity regions and those where subject to water immersion and lack the re-dispersible feature. Though minimum standards, as addressed above, are in force, the requirements should dictate what waterproof materials and techniques go into preserving the viability and beauty of any deck. The above lawsuit brought out the issue of bonding and if the product peels and cracks it fails to meet the required standards. The ASTM provides that bonding should attain 10psi. That assures that cracking and peeling caused by weather — the freeze/thaw test — won’t occur. Water vapor transmission standards are also provided — along with many other standards. Standards and procedures, as an aside, for testing also exist. With transmission of moisture, the tests are critical. Such standards strike at the very purpose of waterproofing and many regulatory bodies like the ISO, ASTM, BS and DIN issue regulations and guidelines. As such, there exists many tests to determine the rate and amount of moisture that passes through a membrane (waterproofing material). Humidity, dielectrics, materials and more impact vapor transmission. Even hydrostatic (water percolating up through the ground) testing is performed to determine the standards need for a waterproofing product. To put it in a nutshell, the requirements change with the job, location, intended use, and materials used to build the deck, making waterproofing a complex but elegant equation. Added to the equation is the testing by regulators that cover a wide range of conditions and considerations that lead to a great number of rules and standards. Contact us, Pli-Dek Systems, to learn more about how your deck is protected by waterproofing materials and techniques and the standards and requirements promulgated by regulatory bodies that help make that so.